So here is my first tip. When you pack a camper trailer or caravan for its first time outing always go over a weighbridge and find out if you are within the trailers maximum load capacity. Why because a huge amount of accidents happen from overloading. Off road and 4X4 vehicle owners also need to check the maximum allowable towing capacity recommended by vehicle manufacturers. Every vehicle is different. Every trailer hitch also has different load limits. What about the weight range of the tyres on the trailer / van? Are they a light truck tyre? Can they carry the load? Now remember just because its under weight this time doesn’t mean its going to be under weight the next time. This is usually the case because different gear is required for each different vacation or trip. Hence the change in the overall weight. From experience I know that is is fairly easy to be caught out. I once had a customer who was complaining that the springs on his camper trailer were rubbish and not of a good quality. So I suggested he bring it round fully loaded so I could see the problem they were experiencing. I asked Tony what he thought his trailer weighed, as I knew it had a max capacity of around the 900kg. Tony claimed quite firmly that everything that he had packed was mostly light items so there was no way they were anywhere near the maximium capacity of 900kg. The trained eye could see it was way over so without arguing I suggested we go for a drive to the local weigh bridge. When we weighed the camper trailer his eyes nearly popped out of his head when he saw the weigh bridge meter hit 1350kg and he didn’t even have the tinny on the top he usually carried. That’s 450kg over weight. The only problem he had was to much gear. So I that you can even imagine the surprise that he had. It is easier to imagine than you would think. If your trailer is overloaded, your cars towing capacity exceeded, your trailer hitch capacity is exceeded… etc what chance have you got in an emergency stop. You have virtually no chance for your caravans or trailer to stop on time. 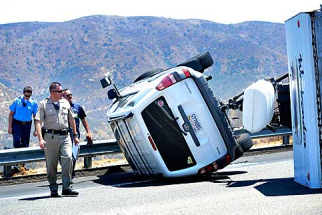 Take a look at the pic and you will see that not only is the caravan on its side but the car as well. In addition to the safety aspect, how is your insurance affected by overloading trailers? Well you can avoid this by having a 360degree articulating hitch like the OzHitch. The reason is if your camper or trailer goes over, with a standard hitch and its limited movement on a ball hitch the vehicle that goes over will drag the other over being van or four wheel drive. If you have a off road hitch that articulates 360degrees then if the van goes over it would be unlikely to pull the towing vehicle over as well. So heaps of safety built into having a good offroad coupling. Have a look at the safe towing information booklet in our Downloads section. (ATM) Aggregate Trailer Mass is the total mass of the fully laden trailer when carrying the maximum load recommended by the manufacturer. This includes any mass imposed onto the drawing vehicle (drawbar down weight) when the combination vehicle is resting on a horizontal supporting plane. (GTM) Gross Trailer Mass is the mass transmitted to the ground by the axle or axles of the trailer when coupled to a drawing vehicle and carrying its maximum load approximately uniformly distributed over the load bearing area.